I read an obituary today for Preston Langley Hickey, a teller of weird tales and--as it turns out--a publicist for the studio that made everyone's favorite monster movies from the 1950s. You can read more on the original posting for him, here, now updated. Thanks to Andrea Fisher at the Lakewood Public Library, Lakewood, Ohio, for locating the obituary. Preston Langley "Duke" Hickey (1900-1962). Photograph from the Cleveland Plain Dealer. 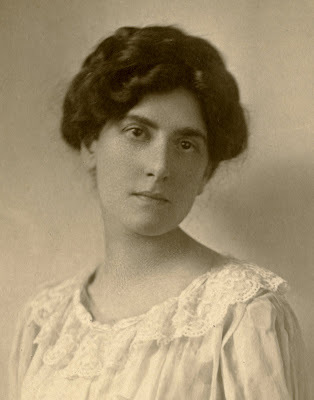 Stella George Stern was born on December 8, 1877, in New Orleans, Louisiana, and attended the Southern Academic Institute, Newcomb College, and Barnard College of Columbia University in New York City, where she was class poet and a founding member of a sorority, Alpha Omicron Pi. Stella graduated from Barnard in 1898 and went directly into advertising, working for the John Wanamaker department store in New York City. Eventually she ran her own advertising agency with local and national accounts. She married George Hough Perry on September 19, 1906, and lived most of her adult life in New Jersey, New York, and San Francisco. Stella G.S. Perry wrote poems, stories, articles, novels, and non-fiction. Her books are many, from Go to Sleep (1911), Melindy (1912), and When Mother Lets Us Act (1913) to several works of non-fiction published late in her life. Her native Louisiana was the setting of a couple of her novels, Palmetto, The Romance of a Louisiana Girl (1920) and Come Home, A Romance of the Louisiana Rice-Lands (1923). She wrote just one story for Weird Tales, "Old Roses," published in the August 1931 issue. A suffragist, socialist, and Unitarian, Stella worked on behalf of women and children's welfare in her adopted home state of New Jersey. Her husband was appointed Director of Exploitation (yes, that was his title) at the Panama-Pacific International Exposition in San Francisco in 1915. Stella wrote two books on the art and sculpture of the expo, one with the sculptor Alexander Calder. Stella G.S. Perry died in Brooklyn, New York, on November 7, 1956, a month and a day short of her seventy-ninth birthday. An Internet search for Stella G.S. Perry's name and "Alpha Omicron Pi" will result in several brief biographies of her. The Louisiana Historical Association has a lengthier biography of her at its website, here. Author and social reformer Stella G.S. Perry (1877-1956). 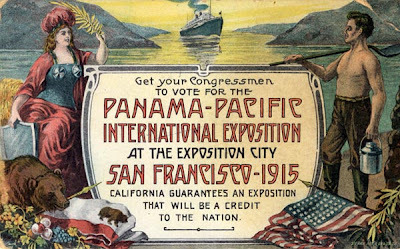 A postcard for the Panama-Pacific International Exposition. Stella G.S. Perry compiled two books on the art of the exposition, The Sculpture and Mural Decorations of the Exposition (1915) and The Sculpture of the Exposition (1915, with A. Sterling Calder). Thanks to Randal Everts for providing Stella G.S. Perry's place of death. By sheer coincidence, I heard from Weird Tales researcher Randal Everts within just a few minutes of posting my entry on Johns Harrington the other day. Mr. Everts, who has been looking into Weird Tales for many years, once wrote an article on four anthropologists who had work published in "The Unique Magazine." I had already posted an article about the anthropologist Alanson B. Skinner (here), but I had also written about another anthropologist without realizing that he, too, was a teller of weird tales. The anthropologist was Johns Harrington's father, Mark R. Harrington. His story was called "Teoquitla the Golden," and it appeared in the November 1924 issue of Weird Tales under the name Ramon de las Cuevas. Mark Raymond Harrington was born in Ann Arbor, Michigan, on July 6, 1882. 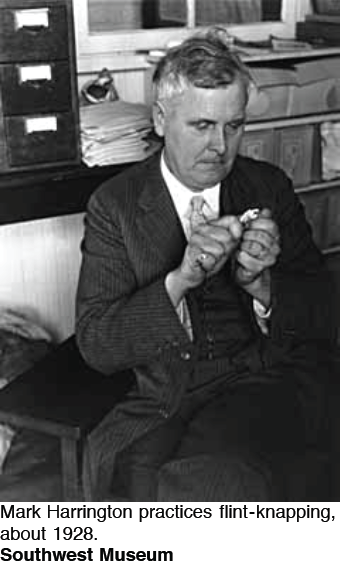 His father, Mark W. Harrington, was something of a Renaissance man, teaching geology, mathematics, botany, and French, as well as serving as curator of the University of Michigan museum. The younger Harrington was fascinated by Indians and their culture even from a young age and began learning their languages and their ways. His family moved to Mount Vernon, New York, where Harrington began collecting Indian artifacts, a hobby that earned him an introduction to F.W. Putnam and the American Museum in New York. Putnam took Harrington under his wing, and so a career in anthropology, archaeology, and curation began. Harrington received his master's degree in anthropology from Columbia University in 1908 and began field work in the United States and Cuba that would culminate in his monumental discoveries in Nevada during the 1920s and '30s. There is an excellent account of this phase of Harrington's career at the website of the Las Vegas Review-Journal's "First 100," here. In 1928, Harrington became director of research and soon after curator of the Southwest Museum in Los Angeles. He would spend the rest of his career with the museum, eventually being named curator emeritus. He was also a historical preservationist and consultant on restoring historic buildings. 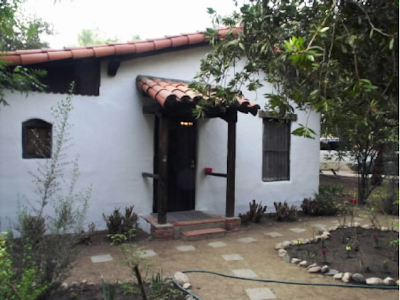 He himself restored an old adobe home in which he raised a family during the 1930s and '40s. Harrington also preserved names from the past. 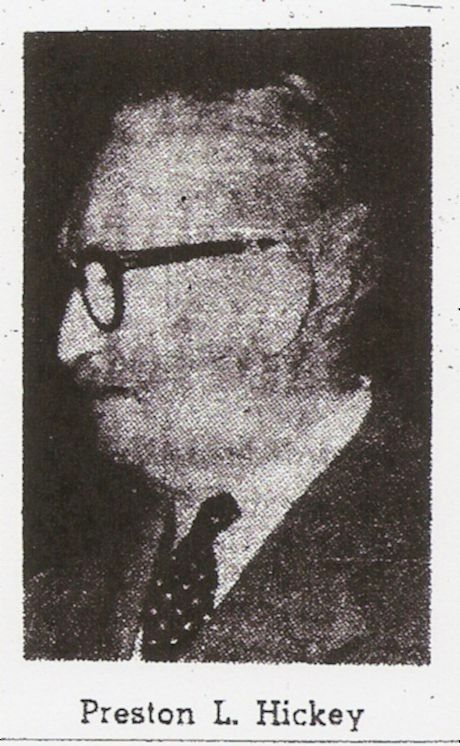 In the course of his research, Harrington ran across a historic name, "Ramon de las Cuevas," and adopted it as his nom de plume for Weird Tales. 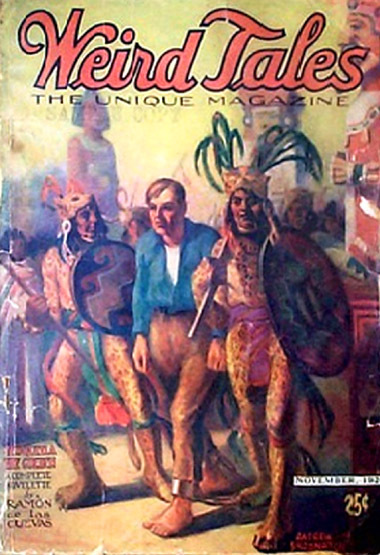 Harrington's only known story for "The Unique Magazine" was "Teoquitla the Golden" from November 1924, the first issue with Farnsworth Wright as editor. Harrington wrote many works of non-fiction under his own name as well. To follow the trail of a forgotten people, to play detective upon the doings of a man who has been dead 10,000 years or so is a thrilling pastime to an explorer under any circumstances. But when the trail leads into a rich virgin field never disturbed by the spade of the relic hunter, THEN your sunburned desert rat of an archaeologist thinks he has discovered a real paradise. I have listed some sources for further reading above. Another good source is a biography by Bruce Bryan, a fellow anthropologist and teller of weird tales, published in The Masterkey, the journal of the Southwest Museum, in the July-September 1971 issue (Vol. 45, No. 3). Dr. Mark Raymond Harrington (1882-1971), one-time "boy wonder of the archaeological world," discoverer of a lost city in the Southwestern desert, father of Johns H. Harrington, and teller of weird tales. Photo from the website of the San Fernando Valley Historical Society. An adobe house built by Harrington in 1947, located at 11039 Memory Park Avenue, Mission Hills, California 91345. 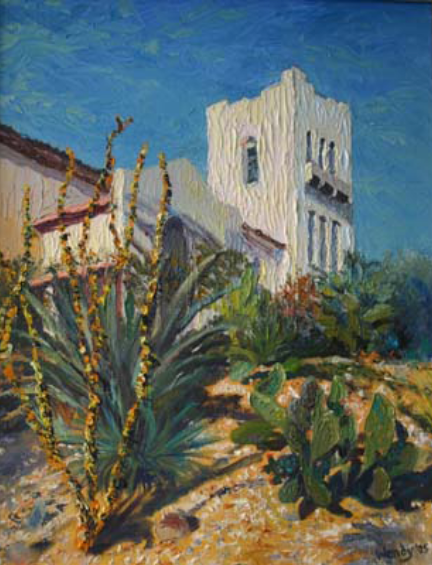 The Southwest Museum, a painting by Wendy Hultquist. Weird Tales, November 1924, with a cover story by Ramon de las Cuevas, aka Mark Harrington, and cover art by Andrew Brosnatch, his first for "The Unique Magazine." Note: Thanks to Randal Everts for his lead on Mark R. Harrington as Ramon de las Cuevas and for a copy of Bruce Bryan's biographical article from The Masterkey. 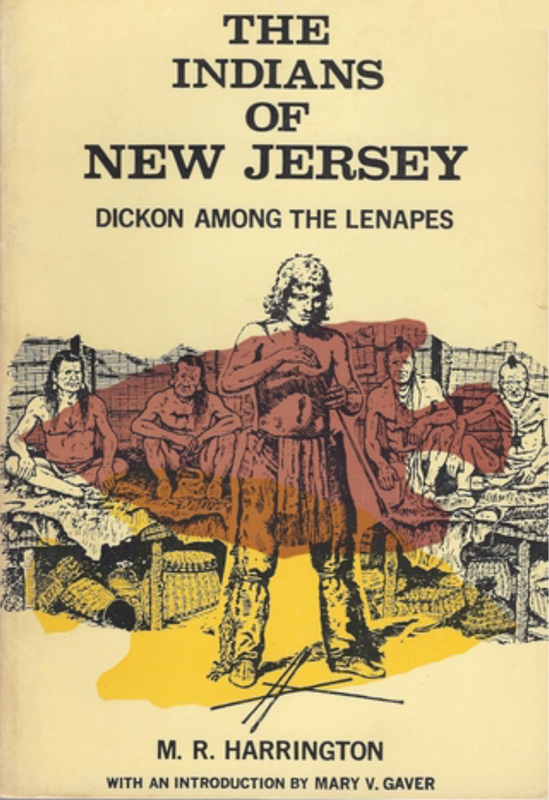 Addendum (Jan. 9, 2015): The Indians of New Jersey: Dickon Among the Lenapes by M.R. Harrington (1963). The cover artist may have been Don Louis Perceval (1908-1979), but I can't be sure. Clarence Ellsworth (1885-1961) was another illustrator of this book, though not necessarily of this cover or this edition. In any case, thanks to Bob (comment below) for drawing this book to my attention. Johns Heye Harrington was born on September 15, 1918, in New York. His father, Mark R. Harrington (1882-1971), was an anthropologist, archaeologist, author, and museum curator who worked at the American Museum of Natural History, the Peabody Museum of Harvard, and the Museum of the American Indian, Heye Foundation (where he would have crossed paths with Alanson Skinner, subject of a previous posting). In 1928, Dr. Harrington relocated to California to assume duties as Director of Research at the Southwest Museum in Los Angeles (now part of the Autry National Center). Over the course of his long career, Dr. Harrington excavated a number of important sites in the American Southwest, including one called The Lost City, located in Nevada. He also lived among and studied 43 Indian tribes. In 1930, Dr. and Mrs. Harrington acquired an old, abandoned adobe house. They renovated the house and lived there until 1945. Their son, Johns Harrington, must have lived an exciting childhood. Johns Harrington attended the University of Southern California (USC) for four years, serving on the staff of The Wampus (the college humor magazine), The Daily Trojan (the college newspaper), and The Alumni Review. In his senior year, he served as president of his chapter of Sigma Delta Chi, the National Professional Journalism Fraternity. 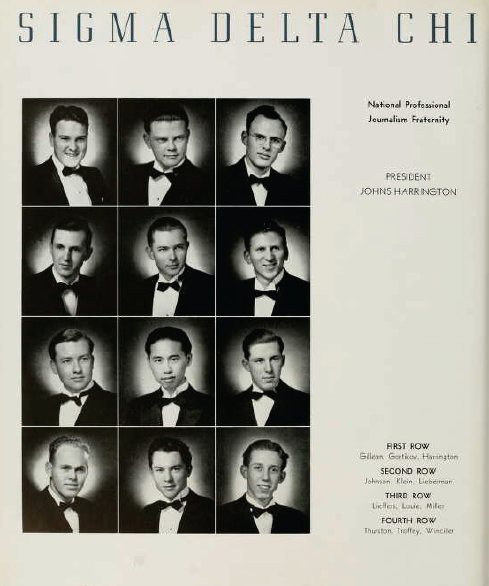 He was also member of Phi Kappa Phi and graduated in 1940. World war interrupted his budding career. He enlisted in September 1942 as a private. After the war, Harrington carried on in his chosen field. He wrote travel articles that appeared in the New York Times, Los Angeles Times, and Desert Magazine. He spent many years--perhaps a career--with the Los Angeles City Schools as editor of publications. He also contributed to educational journals and books. 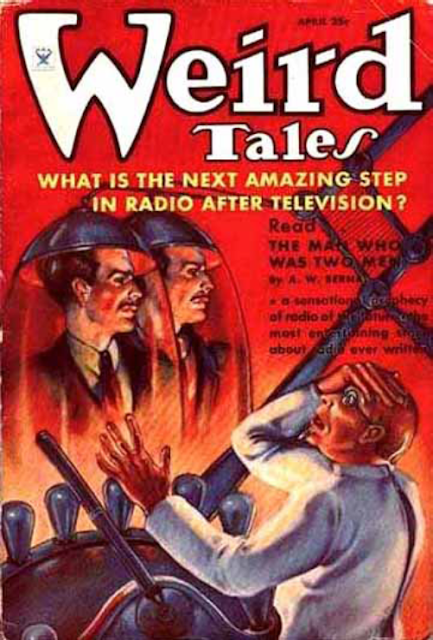 His work for Weird Tales consisted of a single story, "The Teakwood Box," from March 1938. At the time the story was published, its author was a student at USC and all of nineteen years old. Harrington lived in Tujunga, California, for many years. His last residence was Glendale. Johns H. Harrington died on October 10, 1992, probably in California. You can read more about Mark Harrington at the website of the San Fernando Valley Historical Society, here, and at the website of the Las Vegas Review-Journal's "First 100," here. Mark R. Harrington was a prominent anthropologist and archaeologist. His son, Johns H. Harrington (shown here, top right), followed in his footsteps, at least as far as academic achievement went. Journalist, editor, author, and educator, he also earned a Ph.D.
Harrington's story appeared in the March 1938 issue of Weird Tales. His name was crowded from the cover (drawn by Margaret Brundage) by luminaries such as Seabury Quinn, H.P. Lovecraft, Henry Kuttner, and Jack Williamson. Note: Thanks to Weird Tales researcher Randal Everts for confirmation that Johns Heye Harrington was the writer for Weird Tales and for Harrington's middle name. Mal Bissell lived a long life and was well loved, yet he was often overshadowed by his father and his wife when it came to the world of work. Malcolm Havens Bissell, Jr., was born on October 1, 1916, in New Haven, Connecticut. His father, Malcolm Havens Bissell (1889-1975), was a graduate of Yale University (1911, 1918, 1921), and a prominent geologist, geographer, and humanist. Professor Bissell worked for the states of Connecticut and Pennsylvania and taught at Bryn Mawr College before moving west to establish the Department of Geography at the University of Southern California. He had a long and distinguished career at USC and was eventually named professor emeritus. In addition to studying in France and Germany, Professor Bissell did field work in the American Southwest and elsewhere. He was at one time vice-president of the American Humanist Association and a signatory to the Humanist Manifesto II of 1973. Malcolm Havens Bissell and his wife, Ella Mary Taylor, had two children, Malcolm Havens Bissell, Jr., and Elinor Elizabeth Bissell. Malcolm the son, known as "Mal," wandered through Latin America, working as a reporter and photographer. His story for Weird Tales "grew out of a couple of days I spent at a remote mine in Bolivia," Bissell recalled. At the time, he was "wandering about the country on a mule en route to the U.S.," where he enlisted in the Army on May 26, 1943. A member of the 45th Infantry Division, Bissell saw action in France. When he enlisted, Bissell reported having three years of college. Those three years were probably spent at the University of Southern California. Bissell had met a girl there, another writer, though perhaps more ambitious. While he was in basic training, the couple worked on a mystery story aimed at popular magazines of the day. Set in Acapulco, the story didn't appear in print until after the war. In the meantime, the writing career of Bissell's college girlfriend took off. I haven't found any record of it, but by the late 1940s, Mal Bissell and Jane de Lange Lewis were almost certainly married. Jane de Lange Lewis was born on September 10, 1915, and graduated from Los Angeles High School (where she was a member of the Poetry Club) in 1935. Jane was a Phi Beta Kappa student at USC. The first vice-president of her chapter was none other than Kenneth M. Bissell, Mal Bissell's uncle, and a professor at the university. It isn't hard to imagine that Jane Lewis and Mal Bissell met at USC. (She was in the class of 1939.) Sooner or later they would have married. They also collaborated on their fiction, although Jane's career--uninterrupted by military service--was more successful. 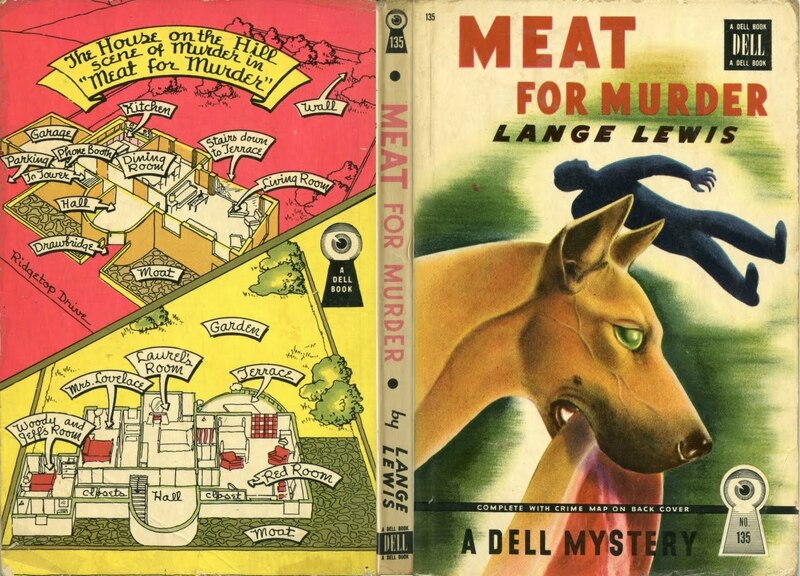 Writing under the name Lange Lewis, she published a number of detective novels during the 1940s and '50s. They included Murder Among Friends (1942), Juliet Dies Twice (1943), Meat for Murder (1943), The Birthday Murder (1945), and The Passionate Victims (1952). Her detective was a large and eccentric man named Lt. Richard Tuck. As Jane Beynon, Jane also wrote Cypress Man (1944). 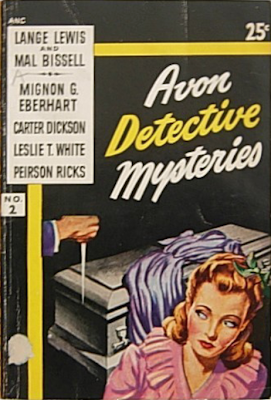 Her story, "Murder in Acapulco," written with Mal Bissell a few years prior, appeared in Avon Detective Mysteries #2 in 1947. Mal Bissell's credits are a little more sparse. He wrote one story for Weird Tales, "The Mask of Don Alfredo," published in the January 1950 issue after it was rejected by The Saturday Evening Post and several other magazines. Having written it in the 1940s, Bissell submitted the story as a graduate student at the University of Chicago. According to the author, his other writing "was limited to short pieces for Popular Photography, a few rejected short stories and at least one unfinished novel." Long-time resident of Tucson and Sonoita [Arizona], born October 1, 1916, passed away January 1, 2006. He was a man like no other, who was much loved and will be greatly missed by his family and friends. There will be no funeral or memorial services. Jane de Lange Lewis continued writing after her marriage to Bissell ended. 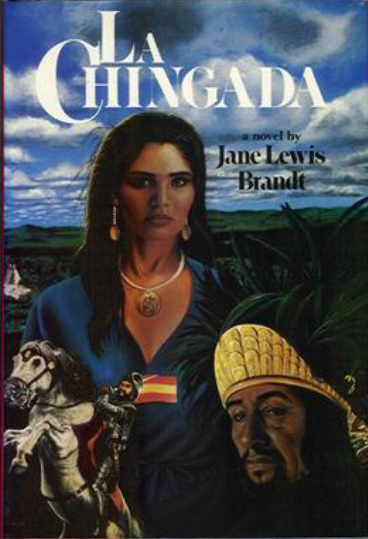 As Jane Lewis Brandt, she authored several novels of historical and contemporary romance: Love in the Hot-Eye Country (1975), La Chingada (1979), Malinche (1980), and Firebrand (1983). She preceded Mal Bissell in death, but only by three years. Her last residence was Sherman Oaks, California. Her death came on February 1, 2003. Jane Lewis Brandt's novels of the 1970s and '80s, though out of print, are still readily available. The couple's older work is harder to find. The front and back covers of Lange Lewis' Meat for Murder (1943), one in a series of Dell's popular "map-back" paperbacks. "Murder in Acapulco" by the husband and wife writing team of Lange Lewis and Mal Bissell appeared in Avon Detective Mysteries #2 (1947). Jane Lewis Brandt wrote several novels during the 1970s and '80s, including La Chingada (1979). Thanks to Randal Everts for further information on Mal Bissell. Send News . . .
Feel free to send whatever you have: memories, family stories, photographs, clippings, photocopies, letters--it doesn't matter. Anything can help flesh out the bare bones of fact. 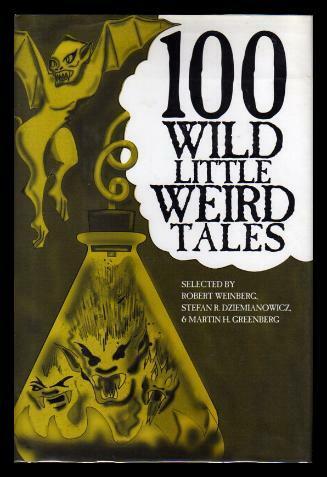 I read on one blog that a family member has stories from a writer of weird tales, stories never published. I'm open to publishing things like that on my blog as well. In any case, I look forward to hearing from you. Weird Tales, November 1941, with a cover by Hannes Bok anticipating America's entry into World War II and illustrating Frank Gruber's "Book of the Dead." Many decades later, Weird Tales author E. Hoffman Price published a memoir with same title, telling of the men and women he had known in association with the magazine and his own writing career. 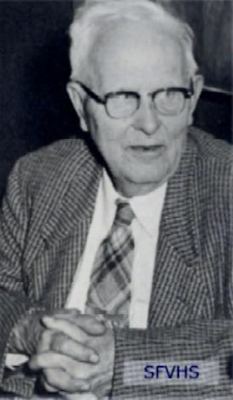 Pulp writer Harold Freeman Miners was born on January 11, 1890, in St. Joseph, Michigan, and graduated from St. Joseph High School and Michigan Agricultural College, the forerunner of Michigan State University. He served in the Michigan Naval Militia and--during World War I--the U.S. Navy. At the time he registered for the draft, he was working in the advertising business at the California Fruit Growers Exchange in Chicago. He wrote stories for several magazines, including Argosy All-Story Weekly, The Black Mask, Far West Stories, Fighting Romances from the West and East, McFadden Fiction-Lovers Magazine, Western Story Magazine, and of course Weird Tales. His only story for "The Unique Magazine" was called "Desert Madness," published in the fourth issue, June 1923. The illustrator on the cover and for Miners' story was Heitman, subject of a future blog entry. Miners contracted a severe case of influenza while serving in the Navy. His health deteriorated to a point where he was forced in 1921 to a more hospitable climate in Colorado Springs, Colorado. He spent the last year of his life in a Denver sanitarium and died on February 22, 1928. His body was returned to his hometown for burial. He had not yet reached his fortieth birthday. Short of buying an old pulp magazine, you're not likely to find any of Miners' work in print. Weird Tales, June 1923, with a cover story by Paul Ellsworth Triem, cover art by Heitman, and fiction by Harold Freeman Miners, Hamilton Craigie, Otis Adelbert Kline, and others. Note: Thanks to local genealogist Brenda Sears for information on Miners' death year and place of burial. Thanks also to Jill Rauh at the Benton Harbor Public Library, Benton Harbor, Michigan, for locating his obituary. "It's hard to be both a good mother and a good gardener. Either the flowers or the children are apt to run wild." 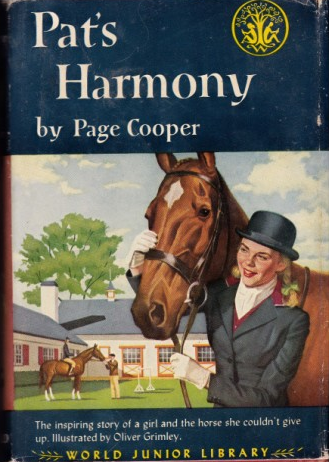 As you can see, Page Cooper began her career writing biography (and autobiography). 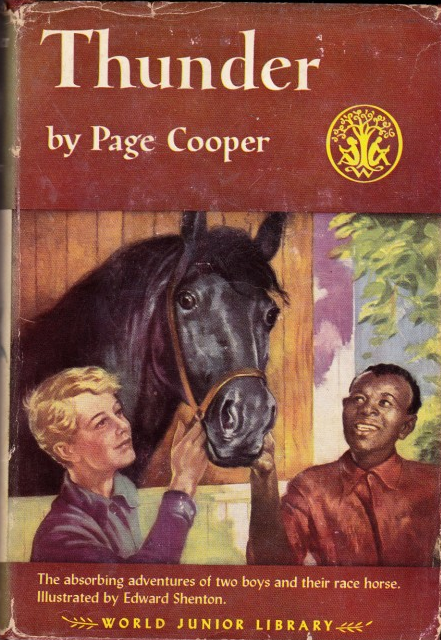 She closed it by writing novels, mostly children's novels about horses. 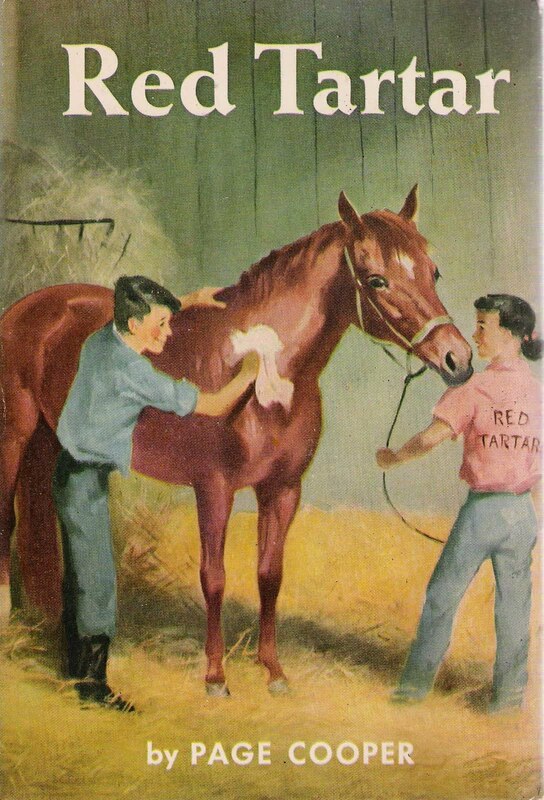 Readers of horse stories will never forget her. Elwood Franklin Pierce was born on Christmas Day, 1886, in Elkton, Maryland. By the time he was twenty-two (and living in Chester, Pennsylvania), he was working as a newspaper editor and supporting his parents. In fact he spent much of his life supporting his family and seems not to have married or had children. Pierce worked for a newspaper in Philadelphia at the time of the First World War. By 1930 he was living in Los Angeles. Between 1924 and 1930 he authored tales for Battle Stories, Breezy Stories, and Everybody's Magazine. 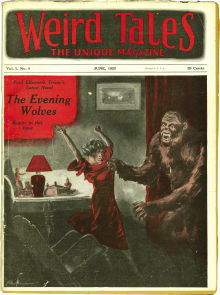 Also during that period, Weird Tales published the only story he would write for "The Unique Magazine." It was called "The Dream of Death," and it appeared in the July 1925 issue. 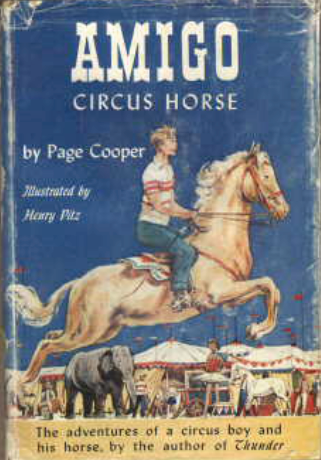 In 1928 Duffield and Company published Pierce's novel of adventure for boys, Give a Boy Luck. At his death he was working as wire editor for the International News Service. Pierce died at home on June 1, 1940, in Los Angeles. He was just fifty-three years old. Arthur William Bernal was born on September 12, 1913, in Oakland, California. An early fan of science fiction, he started writing at age fourteen and broke into magazines with letters to Astounding Stories of Super-Science (June 1930) and Amazing Stories (Aug. 1930). A year later, he provided the cover story ("Cosmic Menace") for the summer issue of Amazing Stories Quarterly. He wasn't quite eighteen years old. Bernal's "Anaphylaxis" appeared in the July 1935 issue of Fantasy Magazine. He was only twenty-three years old when the magazine offered "A Biographical Sketch of A.W. Bernal," by Alvin E. Perry, a few months later (Jan. 1936). Bernal wrote several more tales for Amazing Stories during the 1930s and '40s: "Draught of Immortality" (Dec. 1935), "Paul Revere and the Time Machine" (Mar. 1940), and "King Arthur's Knight in a Yankee Court" (Apr. 1941). Writing science fiction helped pay his way through school. By 1941, Bernal was ready to pass the baton on to younger writers. He ran into one of those young writers at a science fiction convention. The young man had one of Bernal's cover stories pinned to his garage door and told him that someday he would be a good writer like Bernal. "I can remember his name," wrote Bernal. "It was Ray Bradbury." Weird Tales proved a good market for Bernal's fantastic fiction. "The Unique Magazine" published five of his stories, two of which were multi-issue serials. "The Man Who Played with Time" (Mar. 1932) was the first, presaging Bernal's interest in time travel stories. "Vampires of the Moon" (serial, May-June-July 1934), "The Man Who Was Two Men" (Apr. 1935), "Satan in Exile" (serial, June-July-Aug.-Sept. 1935), and "So Very Strange!" (Apr. 1937) followed. 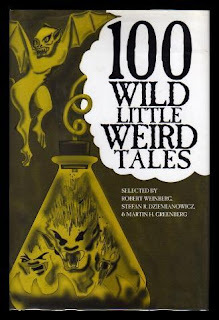 Weird Tales expert Robert Weinberg called "The Man Who Was Two Men," a science fiction comedy story, "a major disaster" and "among the worst stories ever published in Weird Tales." True or not, that didn't stop the editor from making it the cover story for April 1935. "Satan in Exile," by the way, should not be confused with Paul Ernst's series of Doctor Satan stories which began coincidentally in August 1935, halfway through Bernal's similarly titled serial. At the same time he was writing stories about vampires and devils, Arthur William Bernal began what would have been considered a more respectable career as a journalist. He attended the University of California at Berkeley, majoring in public speaking and graduating in 1936. He married in 1938 and settled in Beverly Hills. (Henry Kuttner lived in Beverly Hills at the same time. The two men may very well have known each other in that small world of Los Angeles fandom, a world that included Ray Bradbury and Forrest J. Ackerman.) Bernal continued writing into the early 1940s, but Uncle Sam came calling, and he enlisted in the U.S. Army in 1943. With his background in journalism (and perhaps with some connection to moviemaking), Bernal went to work on training films during the war. After the war, Bernal worked for a company that made animated cartoons, then freelanced for Corporate Image Films, producing promotional films for industry. In the early 1960s, he created his own company, Firebird Films, and returned to animation with "The Foolish Frog" and "Leopold, the See-Through Crumb Baker." By the end of the decade, he had begun writing reviews of restaurants and soon adopted the pen name "Stendahl." As Stendahl, Bernal appeared on radio and in newspapers between 1970 and 1989. He also wrote six books on food, restaurants, and cooking, and wrote and produced two films on wine tours of Europe. After a long and varied career, Arthur William Bernal died on October 13, 1991, in Bayside, Queens, New York. I don't know of any reprints of Bernal's work, but he wrote several books on food, cooking, and restaurants. His obituary in the New York Times (Oct. 16, 1991) offers a good deal of information on his life. Arthur William Bernal, a picture from his college yearbook, University of California at Berkeley, ca. 1936. 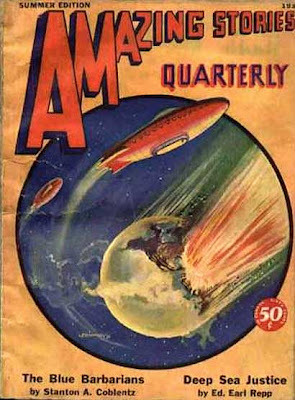 The cover of Amazing Stories Quarterly, Summer 1931. 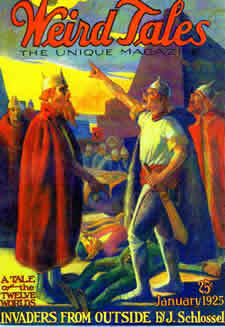 Although Bernal's name does not appear on the cover, the illustration (by Leo Morey) shows a scene from his story, "Cosmic Menace." It was Bernal's first published story in a decade-long career as a pulp fictioneer. 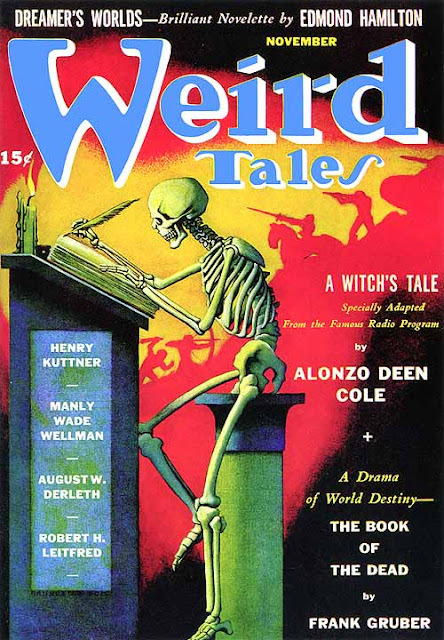 Margaret Brundage provided the illustration for Bernal's only cover story for Weird Tales (Apr. 1935). What is the next amazing step in radio after television? Bernal's story, "The Man Who Was Two Men," provided one possible answer. 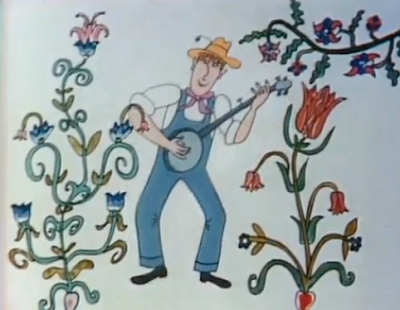 An opening still from Arthur William Bernal's animated short, "The Foolish Frog," sung by Pete Seeger, adapted and directed by Gene Dietch, and animated by a Czechoslovakian studio. You can view the video on YouTube, here. Thanks to Randal Everts for further information. E. Thayles Emmons, also known as Edwin Thayles, Edwin Thales, or just plain E. T. Emmons, was better known to the residents of Geneva, New York, as the editor of their daily newspaper. Emmons wrote one story for Weird Tales. It was called "Two Hours of Death," and it appeared in the May 1923 issue of the magazine, only the third issue to see print. Emmons was born on April 11, 1882, in Woodstock, Vermont, and grew up in Taftsville. After graduating high school in 1899, he worked for a string of newspapers--Vermont Standard, Brockton Times, Boston American, Syracuse Evening Telegram, Rochester Herald--before arriving at the Geneva Daily Times in 1906. He remained with the newspaper for decades to come and in 1945 became executive editor. Emmons was an indispensable figure in his adopted hometown. He was president of the Geneva Historical Society and the local botanical society and member of numerous other organizations and civic groups. Emmons also wrote stories and nature articles for magazines, a column called "Days of Yore," and a local history, The Story of Geneva (1931). I have found just two magazine credits, Emmons' story for Weird Tales, and another in Locomotive Engineers Journal. In addition, Emmons was a birdwatcher and participated in annual bird censuses. His hobby was collecting ferns. Emmons came from an old New England family. His descendants still call New York home. The Rochester Chapter of Sigma Delta Chi, the National Journalism Fraternity, honored Emmons in January 1969 for his seven decades in the profession. He died on May 17, 1971 in Geneva at the age of eighty-nine. You can read Emmons' story, "James Crowley-Gentleman" from Locomotive Engineers Journal, on Google Books. 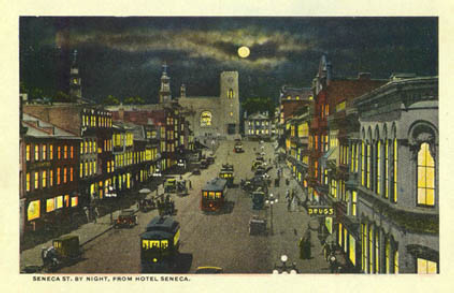 "Seneca St. by Night, from Hotel Seneca." Geneva, New York, would have looked like this at about the time Edwin Thales Emmons arrived there to begin work at the Geneva Daily Times in 1906. Thanks to A Family Member for further information on Edwin Thales Emmons. One of the problems with researching the women who wrote for Weird Tales is that they can be hard to find in census and other records. Married women often did not give a trade or profession to the census enumerator, either because they did not make a living as writers, or because of conventions that said that a man is the breadwinner of the family and that his wife should not work outside the home or for pay inside the home. Women of course were not required to register for the draft. Draft registries are an invaluable record for information on male writers. In addition, a woman's unmarried name can be hard to find. But if the evidence is compelling enough, the researcher can draw conclusions as good as any that are likely to appear. First, "Lenore E. Chaney" or just "Lenore Chaney" would seem a common enough name. Surprisingly, it isn't. A search of the census records pretty quickly yields a woman born in Illinois, married to a man named Osborne E. Chaney, and who was a longtime resident of California. Second, that same Osborne E. Chaney called himself a journalist and a magazine publisher. It isn't much of a stretch to speculate that his wife was a writer herself. Third, of two known stories authored by Lenore E. Chaney, one concerned a businessman and a lost son and was printed in a railroad magazine. Chaney was of course a businessman whose son may have been lost, while his brother, Oscar Chaney, was a railroad brakeman. Fourth, Chaney told a Federal judge in 1918 that he was returning to life on the farm. Whether he did as he said, his wife in fact became a farmer. And last, Lenore E. Chaney was of an age to contribute to Weird Tales in 1925. My friend is reading a book called Angle of Repose by Wallace Stegner (1971). As in Stegner's earlier and more autobiographical book, The Big Rock Candy Mountain (1943), Angle of Repose follows the exploits of a male character--a husband and father--who is always looking for the next big thing--always scheming, always chasing a prize that forever remains just beyond his reach. Lenore E. Chaney's husband may have been such a man. Born in Bedford, Iowa, in 1877, Osborne E. Chaney first shows up in the records I have found in 1906, a journalist by trade with a residence in Kansas City, Missouri. His son was born in Minnesota in about 1908. In 1910, he and his wife were living in Berkeley, California. Chaney was by then a magazine publisher and may have put out a journal called Irrigation. At the time he registered for the draft during World War I, he was on the opposite coast running his own firm, O.E. Chaney and Company, and selling stocks and bonds. That's where his troubles began. He became involved with Emerson Motors Company, an up-and-coming concern that was going to manufacture automobiles. Only it wasn't. Instead, Emerson Motors was, in the words of a complaint against it, "a stock jobbing scheme." Indicted by a Federal grand jury in 1917, those involved with the scheme, Osborne E. Chaney included, were convicted and sentenced in July 1918. Chaney got off pretty lightly all things considered. He was fined $10,000 and placed in the custody of U.S. Marshals for one day. "The prisoner," the New York Times reported, "told the Judge that he intended to give up the brokerage business and go back to a farm." When he applied for a passport two years later, Chaney was still in the business of selling stocks and bonds. His destination according to his passport was the Bahamas, his purpose, "recreation." He planned to take the "first vessel after receiving [a] passport." Evidently, Chaney was eager to leave the United States. There is no mention of his wife in the application as there had been in 1906 when he first sought a passport. In 1924 and 1925, Chaney made trips to Europe. Now his occupation was mine owner. Again, his wife's name was conspicuously absent. The woman who endured all this was Lenore E. Johnstone Chaney. (The"E" may have stood for Edith.) She was born in Pittsfield, Illinois, on December 6, 1881, and was married to Osborne E. Chaney by 1906. If this is indeed the same Lenore E. Chaney, she wrote two stories for publication as far as I can find. The first was called "The Bowes Street House," and it was published in The Cavalier on April 26, 1913, and reprinted in Locomotive Engineers Monthly Journal in 1915. The second was a novelette, "White Man's Madness," published in Weird Tales in January 1925. By the time that story was published, she and her husband may have gone their separate ways. In 1930, Lenore was listed as the head and sole member of her household in Contra Costa County, California. Her occupation was chicken farmer. Lenore E. Chaney lived in California for many years, in Berkeley, San Francisco, and perhaps other places. Her last address was Pacific Grove in Monterey County. Lenore died in Monterey County on April 27, 1972. She was ninety years old. Lenore's story, "The Bowes Street House," is available on Google Books. Lenore E. Chaney's novelette, "White Man's Madness," appeared in Weird Tales in January 1925. Lenore shared those pages with some high-powered authors, including E. Hoffman Price, Henry S. Whitehead, Seabury Quinn, Frank Belknap Long, Arthur J. Burks, Greye La Spina, and H.P. Lovecraft. The Lenore E. Chaney of whom I wrote was in fact the writer and the wife of Osborne E. Chaney. Confirmation comes by way of an obituary provided by Weird Tales researcher Randal A. Everts and printed in the Monterey Peninsula Herald, April 28, 1972. Lenore Edith Johnstone Chaney was born on December 6, 1881, in Pittsfield, Illinois. Her husband was a businessman and onetime president of the Amador Mother Lode Mining Company. That concern was still in business in 1935. During the 1920s, Lenore Chaney was involved in California politics, serving as campaign manager for Friend W. Richardson, governor between 1923 and 1927. She also lobbied for passage of the California Community Protection Act. In later life, she became a real estate broker in Walnut Creek, retiring in 1960 to Pacific Grove. Lenore E. Chaney died on April 27, 1972. 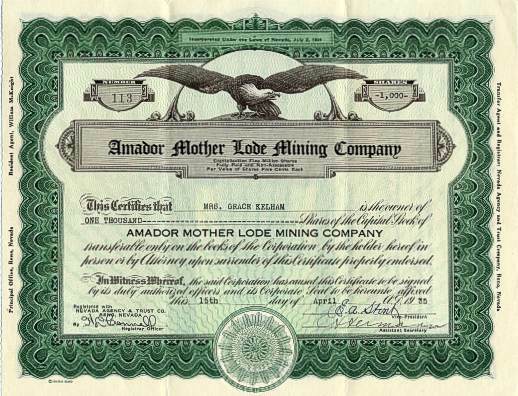 A stock certificate for the Amador Mother Lode Mining Company. The president of the company was at one time Osborne E. Chaney, husband of Lenore E. Chaney.